Roasted radish and asparagus salad | Naturally.Roasted radish and asparagus salad | Naturally. Toss radish and asparagus in olive oil. Spread out in a single layer on a cookie sheet. 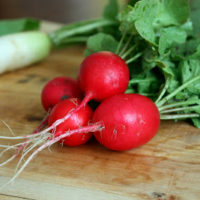 Bake for 15-20 minutes until radish and asparagus is tender. Meanwhile, combine vinaigrette ingredients into a food processor or blender. Mix until well combined and green onion is in small pieces. Once asparagus and radishes are done, toss in vinaigrette. Serve as a side dish or as a topping for a salad.